Wow, you guys went there. Elena (Nina Dobrev) actually died. Should we assume that she goes through the transition and becomes a vampire? After everything, for her to just go gently into the night would be a bit of a buzz kill! It will be very emotional, complicated first episode when the show returns, but the end result is fairly inevitable. Elena's future is pretty set. Elena becomes a vampire early on in the books. Has it always been your plan to change her? It's a good turning point for the character. We were just holding it in our pockets until we were ready. 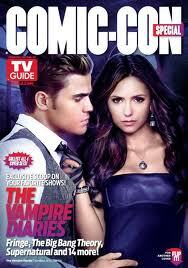 She, of course, chose Stefan (Paul Wesley) in the season finale, but will vampire Elena still want him? That's the best question of all. Everything has changed. Not necessarily how she feels about the boys, but who she is. This may bring her closer than ever to Stefan, or it may give her a deeper bond with Stefan, or it may give her a deeper bond with Damon [Ian Somerhalder]. And she'll start learning things, like how Damon compelled her to forget their first meeting. Those memories will come back, and it'll add more fuel to the fire. And poor Jeremy (Steven R. McQueen)- everyone he loves is now dead! The journey that we have watched Jeremy go on has been great: from confused, grieving, troubled kid to -officially- the man of the house. So we'll see a bit of a role reversal. Instead of Elena being his caretaker, he is going to want to be hers. Is that the last we'll see of ghost Alaric (Matt Davis)? He promised Jeremy that he'll always be there for him. And he will. He definitely will. We take it that all deals are off now and Damon will be staying in Mystic Falls. No one's going anywhere! When we come back next season, one of the first fights between Damon and Stefan will be, "How in the hell could you have saved Matt instead of Elena?" Stefan will be kicking himself, and feeling that guilt, for putting Elena in this predicament. This could tear the brothers apart. If Klaus (Joseph Morgan) has possessed Tyler's body, where is Tyler (Michael Trevino? All I have to say about this is that you have to look at the times we've done this before, which was when Klaus possessed Alaric, and when Rebekah [Claire Holt] was possessed and follow the logic of that. So maybe this isn't the end of Klaus? It remains to be seen which parts of him were actually destroyed. The coffin was shut. It's anyone's guess. The council knows about all the supernatural happenings in town. Now what? That's gonna be a really big problem. One of the first things they'll do [next season] is make their move. 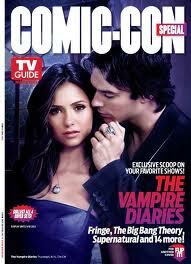 From the TV Guide Comic-Con special magazine.